Every once in a while, an atheopath will claim that "an omniscient God negates free will". This shows a blatant special pleading fallacy: imposing a different standard on others than for oneself. Why is this special pleading? Because free will is impossible in a materialistic evolutionary worldview that atheists presuppose! 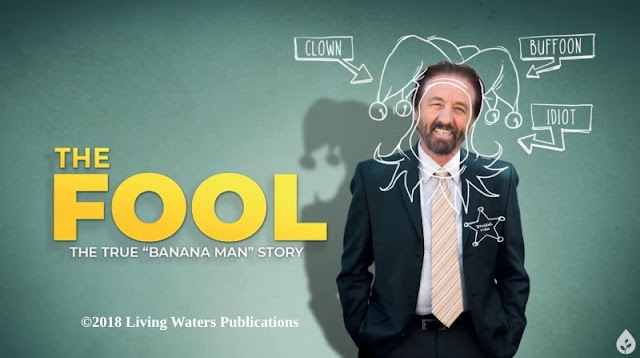 It is also a ridiculous objection because the owhoot is fabricating a simplistic excuse to rebel against the God that he pretends does not exist (Romans 1:18-23, Psalm 14:1). 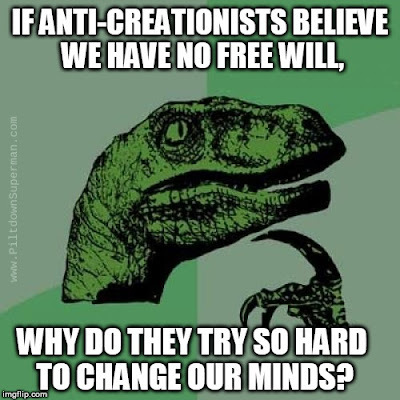 Why is free will impossible for an evolutionist? Because we are just bundles of chemicals responding to what electrochemical dictate, according to materialists. They are atheists because of their chemistry. The Japanese did not have free will when they bombed Pearl Harbor in 1941. Chemistry also "explains" mass murderers, abortionists, faqirs, doctors, philanthropists, biblical creationists — we are all "born that way". So, an atheist has no right to complain about my promoting biblical creation science, if he is consistent in his worldview. If the atheist says something is "wrong", he or she is tacitly denying atheism and standing on the biblical worldview, which makes sense of the preconditions of human experience! For an atheist to object with his simplistic straw man argument about God denying free will, he or she is hypocritical. Theologians have wrestled with ways of explaining free will for a mighty long time. Calvinists have their explanations, Arminians have their ideas, other groups answer the free will question differently as well. There is even dissent among the ranks of various groups. Since I refuse to identify as Calvinist or Arminian and simply identify myself as a Christian who is a biblical creationist, I am not going to tackle the question. It's too big and beyond the scope of this site, you savvy? Even so, I will say that God is sovereign, and he will not do wicked things because he is a loving God and our Redeemer. Here is a modern English section of the 1689 London Baptist Confession of Faith on free will. But I will give you some interesting material to read, even though the atheopath who made the complaint that started this discussion has an aversion to learning (Prov. 18:2 ESV), and I don't think he's read any article he's criticized. Learning the truth is frightening to some folks, I reckon. Secular scientists are being inconsistent by insisting against their worldview that free will exists, and then trying to find it. See "Can Scientists Find Free Will?" for more information. Also, I hope you'll read "No Free Will According to Evolution". Finally, we come to the article that is being featured here today. Atheists are promoting Scientism (an irrational emphasis on the scientific method as a way of life and a de facto religion). Their Scientism involves rejecting free will, and incorporating nature into our choices. This is a kind of pantheism, which is fitting, since evolution is an ancient pagan pantheistic/animistic religion before Darwin made it into a pseudoscience. If a person begins with scientific determinism and a no-exceptions view of the laws of nature, then it makes sense that he would conclude that free will is illusory. However, this still causes many problems for the Hawking and Mlodinow argument. No doubt they would try to persuade people of the veracity of their view. Presumably this is at least one reason for writing this book. However, if free will is an illusion, what is the point of persuasion? If Hawking and Mlodinow are correct, then a person agrees or disagrees, is persuaded or not persuaded, only because he was scientifically determined to do so. Hawking and Mlodinow hold their view and wrote their book only because they were scientifically determined to do so. To read the rest (you have a choice in the matter, you know), click on "The Grand Design and Free Will". Also, for an article on how evolutionary psychologists actively deny free will (which is consistent with evolutionism), click on "Evolutionary Psychologists Deny Their Own Minds". And an interesting parody by ApologetiX is below.